Ramanthapur Sep 24: Genpact Gold -Leaders of various countries made a maiden visit to DBNJ on 23rd Sep 2016 as part of their annual visit. 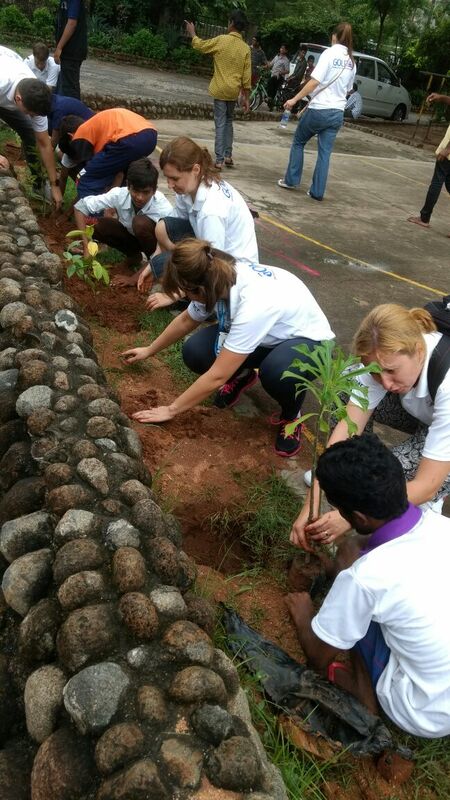 Genpact is the company which has been supporting our institution in various ways as part of their CSR programme. This time as the day of thier visit fell luckily on holiday our children had great time with the visitor. As tradition of DBNJ, our boys welcomed them into our campus with blasts of the trumpets of the band. Leaders of the Genpact were mesmerized for the warm welcome that they received from our institution. Fr. Gnanam the workshop manager of the Vocational Training Centre has taken the visitors of the day around the campus giving basic information of the house and activities that are taking place for the welfare of the children who are in need of care and protection. During the time of explanation the visitors were very keen in taking down every bit of information in black and white as well with digital equipments. During the time of formal gathering Fr. Sudhakar Bellakonda, Director of Don Bosco Navajeevan welcomed the guests and expressed his sincere thanks to them all for their continuous generous help and their constant interest in bringing up our children to reach up to their dreamed goals as dignified citizens in the society. He continued saying that Genpact was instrumental in getting the new machinery equipments for the Vocational Training Centre for our children to learn new crafts in the trade. Our children as unpredictably made the guests spellbound with their outstanding performance through the form of rocking steps during which even the guests could not control but start shaking their bodies for the tunes of musical beats along with our children. It was the time where everyone forgot about themselves and immersed in to the world of joy while making children to rock and roll for steps. As a mark of their presence to DBNJ they all decided to plant a sapling each together with our children all though they dirtied their hands but it was for a great cause which they did so happily keeping in mind global warming and saving of the environment. Play is the activity which unleashes the bound energy of every one without any age difference, all visitors and children divided themselves in to three groups and to play volley ball, basketball and cricket it was the time wherein they involved themselves so intensely continued playing until they are dead tired of the game after which they realized that our children’s stamina is deciphered to be praise worthy. At last the days gathering was wrapped up with distribution of the gifts to the winners of the various competitions and also stationery articles to all children. To satisfy the tired souls of the children they treated the children with satiated snacks as surprise, they looked like a lunch than the snacks. Finally while concluding the program the head of the team Mr. Cartilse said that he is extremely happy to see children coming up in life with the help that they gave and continued saying that they are ready to go to any extent to see that children reach up to their goals in life and finally he wished them all the best. Golden time spent with our children will be not forgotten for their life long for the rich experience that they had.